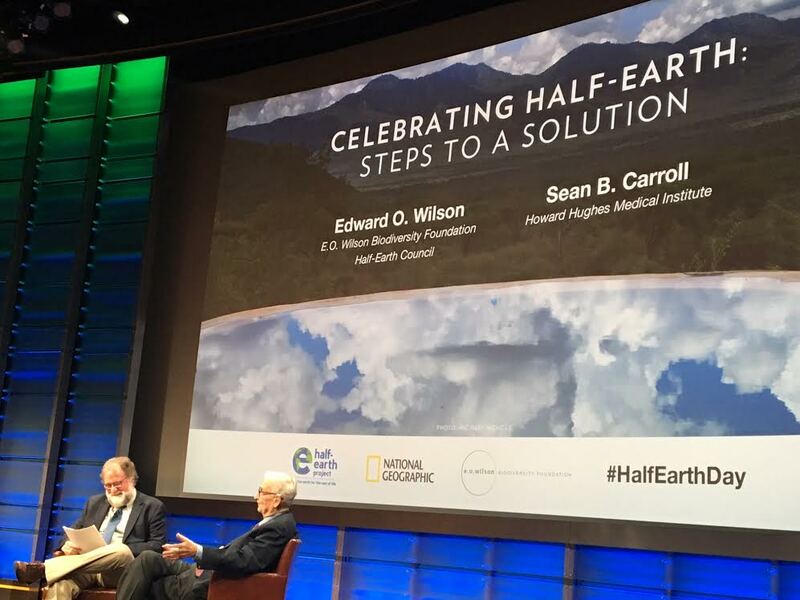 On October 23, 2017 conservationists gathered at National Geographic Headquarters for an event called “Half Earth Day” held six months after Earth Day in April. The half theme was to highlight renowned biologist, naturalist, and author E.O. 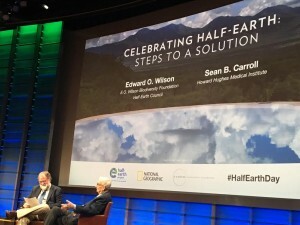 Wilson’s big idea that half the planet is the amount of protected marine and land habitats required to save 80 percent of the world’s species. His book Half-Earth: Our Planet’s Fight for Life (2016) is a compelling manifesto of the why and even the where of what we must conserve in order to reclaim our natural heritage. However, the how to accomplish the aspirational idea of reserving half the surface of the earth for nature has been more difficult to envision. The recent program at National Geographic demonstrated whether this outsized dream might just come true. Most inspiring was a series of presentations that featured young conservation leaders showcasing innovative landscape scale efforts around the world: The Gorongosa Restoration Project in Mozambique, Tompkins Conservation in Patagonia, African Parks, American Prairie Reserve in Montana, and National Geographic’s Pristine Seas project. All these presentations are well worth watching on the E.O. Wilson Foundation web site. While less than 10% of the globe’s terrestrial area is officially protected and only 3% of the oceans, the speakers and discussants spoke confidently of ways to increase these numbers. The approach was not necessarily to set aside huge protected swaths, but to build conservation areas into all human developments. One speaker spoke about the need for “gerrymandering” nature preservation into all that we do. While all of the examples were exciting, the presentation by Dr. Enric Sala, a National Geographic Explorer-in-Residence, and leader of the Pristine Seas Project stood out, as he broke down the complexity of conserving the planet’s oceans into a seemingly doable strategy. A strategy that he has presented to country leaders, business leaders, NGOs, and local governments and communities and that has inspired the establishment of some of the largest marine reserves in the world. Another example of turning ideas into action is the Wildlife Corridors Conservation Act (HR 6448) to establish a National Wildlife Corridors System to ensure that species are able to move between habitats less encumbered by obstacles. Introduced by Representative Don Beyer (D-VA) the bill directs key Federal land and water management agencies to work with each other, as well as with States, tribes, local governments, and private landowners, to develop and manage national wildlife corridors. Although the political climate is challenging for such efforts, the ideas embedded in the bill are already being implemented on the ground in such disparate efforts as the Yukon to Yellowstone a transboundary two countries, five American states, two Canadian provinces, two Canadian territories, the reservation or traditional lands of over 30 Native governments, and a number of government land agencies. And by the Chesapeake Conservation Partnership a regional coalition of over fifty partners engaged in land conservation and related fields all dedicated to saving this large east coast watershed. It was quite an impressive event; inspiring to hear descriptions of large results being creatively accomplished. We all need to hear about that kind of work regularly to remind ourselves of what can be accomplished!